It would have been difficult to keep your eyes in your head if you had the opportunity to walk through the clubhouse of the Cincinnati Reds in the 1970s. Over there was Johnny Bench, the greatest catcher in the game and maybe of all-time. Not far away in another locker was Tony Perez, the jovial team leader and clutch run producer in the lineup. Next to Perez was Joe Morgan, the two-time MVP second baseman, a motormouth who loved to talk baseball with anyone anytime of day. Not far away was Pete Rose, the cocky hit machine who played the game with more enthusiasm than any other man in baseball. Around the corner was the office of manager Sparky Anderson, the graay-haired sage who looked 30 years older than he was, puffed a pipe, and gave out quotes to reporters like a vending machine dispensed candy bars. The Big Red Machine was a star-studded group that rolled over their opponents, not so much beating them as they embarrassed them by hitting, running, smashing, and scoring seemingly at will. They were a team who knew they were good and expected to win every time they took the field. 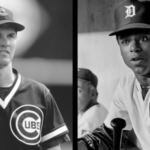 One of those stars, however, was not your prototypical baseball player. He didn’t seem to fit in with his famous teammates at all, except where it mattered most – on the diamond. George Foster wasn’t raised a Red – he came to Cincinnati from the San Francisco Giants in a trade during the 1971 season. Given his contributions to the Big red Machine, the deal proved to be one of the best in Reds’ history. Unlike Morgan, who talked and squawked baseball all day long, arguing over which plays had been the most pivotal in another Cincy victory, Foster was quiet and aloof. Unlike Bench and Rose, who embraced the perks of stardom and the basked in the limelight, Foster shunned the nightlife and stayed in the background. Foster didn’t drink alcohol, nor did he smoke or chew tobacco. In fact, he refused to even drink caffeine. When the Reds were on the road, while his teammates were out enjoying the nightlife in the city, Foster was usually in his hotel room reading a book. The topic was usually eastern philosophy. Foster was a ballplayer when he was in uniform, but he didn’t do any of the things most ballplayers did – cuss, scratch, and generally be rowdy. When Foster first came over to the Reds in ’71 he was frightened to report to a new team where he knew no one. But encouraged by friend and former teammate Bobby Bonds, Foster saw a hypnotist to calm his fears and ease his mind. It seemed to work, though Foster never did become comfortable talking to people, especially the media. His attention to what he put into his body and his fitness regiment produced a remarkable body. At 6’1 and 195 pounds in his prime, Foster was a tall, lean specimen with hardly any body fat. Despite his height, he had a trim 30-inch waist, which he whipped around when he swung his famous black bat. In 1977 he hit 52 homers, becoming the first player since Willie Mays to reach 50 in a season. He was named MVP, joining teammates Bench, Rose, and Morgan in capturing that award. Foster was gifted at more than just baseball – he was a master in karate, an athletic practice that he said taught him “patience, discipline, and balance.” He also relied heavily on his religious faith, and could frequently be seen with his nose in the scripture in the Reds’ clubhouse. 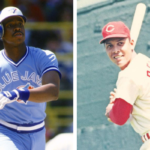 While his more famous teammates were getting much of the glory and spotlight, Foster was content to be an important, but anonymous cog in Cincinnati’s Big Red Machine in the 1970s.